This is a great image! As I recall, a slow-growing suprasellar tumor that has the ability to recur after excision. Welcome to the site, Npath! 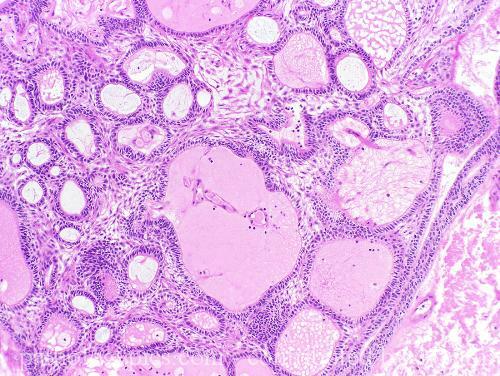 Npath - Great posts and welcome to the site! Wish I had more to add... perhaps the fact that these tumors have a bimodal distribution in age of diagnosis: one mode is centered in early child hood (<10 years old) and one mode a little later (50-60 yo). There is probably something interesting molecularly here, just not sure what it is. Also "wet keratin" rings a bell as an aid in diagnosis - but I don't think it is evident in the photo. Npath's "Non glial tumors" folder.